Knuckles in Sonic 2 prototype 0606 for the Sega Mega Drive was released by drx during the February 23rd, 2008 proto release. Level Select is not enabled by default. At the title screen, pressing , , , , , and then + Start will enable it. 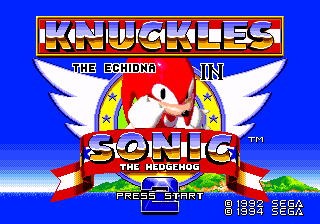 This is the first version to use the "Knuckles the Echidna" banner on the title screen. This page was last edited on 27 September 2018, at 08:27.